The Benefits of Inflatable Boats vs. Hard Hull Fiberglass Boats. HomeBoatsToGo - Blog About Inflatable Boats, Inflatable Rafts, Inflatable Kayaks And More...The Benefits of Inflatable Boats vs. Hard Hull Fiberglass Boats. When most people think about watercrafts, they imagine a slick speed boat screaming through the water. Or a comfortable fishing boat, trolling around the ocean. But the truth is, inflatable boats can give you all of the benefits of hard hull fiberglass boats, but with a lot of added advantages that will make your boating trip both more convenient and more cost effective. When comparing the sale price of inflatable boats versus hard hull boats, it’s clear to see that inflatable equals affordable. Imagine cutting the cost of your boat by thousands of dollars upon purchase. Then add in the fact that you don’t need as big of an engine because the boat itself is lighter, saving you money on buying the engine in addition to the money spent on gas each time you take a trip. 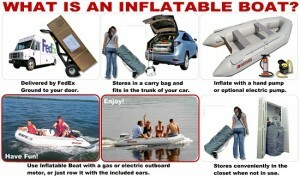 Plus, the portability of these inflatable boats will save you significantly on storage and transport. Add that to the comprehensive warranties that often accompany the purchase of inflatable boats, and the decision becomes even easier. Unlike hard hull fiberglass boats which either take up a ton of space on your property or cost you a lot of money to dock, inflatable boats can be deflated and stored in small spaces at your convenience. Additionally, you don’t need to move them in large trailers. In fact, most of these amazing boats can be deflated and put into the trunk of your car. And with today’s modern pumps, re-inflating them on site is both quick and easy! At first glance, inflatable boats seem like they would be less sturdy than hard hull fiberglass boats. But the buoyancy tubes on the outside of the boat make them incredibly stable in all sea conditions. They are also almost impossible to flip over due to the fact that they ride flat on the water’s surface and have a very low center of gravity. Additionally, the separation of one buoyancy tube from the other will allow your boat to keep afloat even in the unlikely situation where one of the tubes is pierced. And even in that case, the tubes are very easy to repair on the go, making inflatable boats an incredibly safe option for all your boating needs. One great thing about the design of inflatable boats is that even though they are light as a feather, their inflatable nature still allows them to handle heavy loads. That means they can hold multiple people, all your fishing gear, and whatever else you need for a day of fun in the sun. Just load everything onto your inflatable boat in a balanced way, hop on, and enjoy your time out on the water!